Affordable Care Act: Required to Purchase Coverage? Required to Participate in ObamaCare? The Affordable Care Act will be affecting the households of many Americans this year. Also known as ObamaCare, the act was introduced to expand insurance coverage and guarantee that no individual would be refused coverage due to a pre-existing condition. The Affordable Care Act also allowed parents to keep children on their insurance plans until the child reached the age of 26. Despite some of its merits, many Americans have expressed religious and political concerns about participating in the ACA. If you are enrolled in a marketplace health insurance plan, you may receive the Advance Premium Tax Credit. This credit lowers the monthly cost of your insurance. The credit is estimated, so when the tax return is filed you must reconcile the amount you received. After the credit is reconciled, your tax refund or taxes due may be impacted. Many people are unaware of this and are surprised when they end up owing money when filing year-end tax returns. In addition to creating accounting confusion, some Americans have expressed concerns about the program in general. In fact, religious groups ranging from the Catholic Church to many non-denominational churches have publicly stated their concerns. If you or members of your household did not have qualified health insurance for most or all of 2014, you may face a tax penalty. However, you may qualify for an exemption. 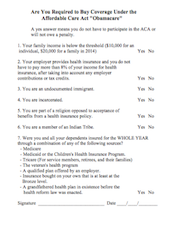 Our “Are You Required to Buy Coverage Under the Affordable Care Act?” worksheet is a simple way to determine whether or not you owe a penalty. If you answer “yes” to all of the questions, you may not have to participate in the Affordable Care Act (or will not owe a penalty). The Affordable Care Act will likely impact your taxes. It’s best to call in the experts to ensure that your taxes are filed properly. The experts at Baker Retirement and Wealth Management are committed to filing your taxes correctly and helping you navigate the often-confusing world of ObamaCare. We have been serving the greater Evansville area (Newburgh, Boonville, Jasper, Henderson, Owensboro, Mount Vernon, and beyond) with guidance regarding tax laws, small business accounting, and more for nearly thirty years. Call Baker Retirement and Wealth Management, PC today at 1-866-244-3517.